If last Sunday was not already a day of rest, it would have been declared a holiday. Everyone referred to March 25th as “Mad Men” Day and the world was silent and still for the two-hour premier. Ok that’s not the case, but it was still a big deal. Such a big deal, in fact, that it received its own themed Uncorked, Unwrapped post. I am sure everyone thought I would do a Hunger Games post, but I am not that predictable (also, it really does not seem appropriate….so I do not volunteer). Although Katniss does get totally drunk in the next book….so there is some potential. But I digress. Let’s start this party. I’ll admit–I did not know how to approach this one. I was at a loss in every which way. I don’t think we really see Don get hammered on wine that often…or really anyone for that matter. In fact, all the liquor in those little glasses is usually brownish in color. Maybe wine is had at dinner, but that’s like water to those men. I mean, they drink martinis for lunch. To find a candy, I looked at all their accounts at Sterling Cooper Draper Price and did not see anything like Mars Bars and there really isn’t any 50s/60s era candy…is there? After asking the boyfriend, he suggested liquor filled chocolates. Now, liquor-filled chocolates seem so innocent (kind of like the 50s amirite?) but are actually quite potent. They’ll make you a bit tipsy if you don’t take them seriously. I figured this would be the ideal treat for ole’ Don. But wine…I had no idea. I just chose the Malbec that came with the Groupon wine deal I had. I did put some thought into it, but only to the point where I knew a red would be better than a white. I took one sip of this wine and thought, this is not what a Malbec should taste like. My second thought was, how the hell did I get to this point where I know that? What the hell is my life? Entrada is not a brand I would recommend. It is a bit too sharp and tangy, which is fine, but not a Malbec attribute. It goes down alright, but it did not have that velvety feel and rich flavor I associate with a great Malbec. If you want to try this brand, open it, pour it, and let it air for about 10 minutes. It starts to get its flavor and matures a bit. The brandy flavor in the chocolate shell alone is astounding. The minute it touched my tongue, I knew this would be intense. Cracking its chocolate shell releases a flow of sweet, rich brandy chocolate. I imagine a dense chocolate cake witha brandy glaze would taste like these babies. Don would certainly approve, because the taste of liquor is very prominent. 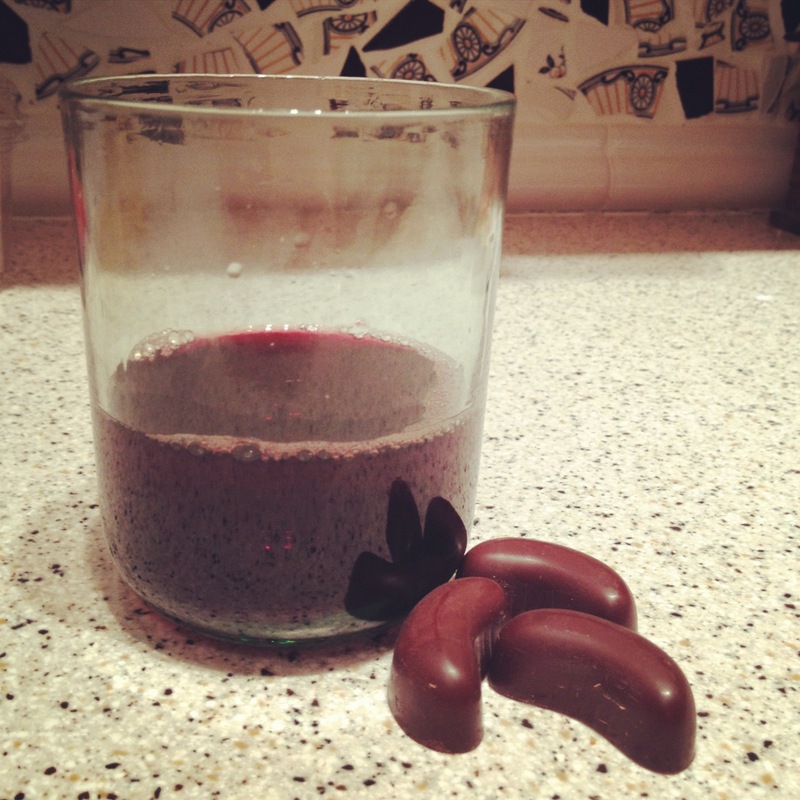 We will be redoing mint next week due to some inspiration from this blog who recommended pairing a port with Thin Mint. Check out the other pairings with Girl Scout cookies. A true genius. Posted in Uncategorized and tagged Brandy, chocolate, Entrada, Groupon, Malbec, Trader Joes. Bookmark the permalink. I may be off Facebook (for now) but that does not mean I’m off blogging. And today we celebrate something we all wish to carry in our hearts in the shape of a four-leaf clover: the luck of the Irish. I know that immediately you are thinking: this is a wine & candy blog, this has nothing to do with Ireland. And yes, I’m inclined to agree with you. That won’t stop me commemorating St. Patrick’s Day. Today we’ll explore the flavor that, somehow, has to do with St. Patrick’s Day: mint. Now, I was curious as to why mint relates to St. Patrick’s Day. Yes, it is green. And yes, Shamrock Shakes is all the proof I need to prove there is a God. But…why mint? Isn’t parsley green? And kale and grass? A quick look on Google really tells me nothing. Thoughts? Why mint, out of all green things? That’s enough exposition. We are not going to find any answers today and my St. Pat’s is rather busy, but not for the reasons that you think. No, I’ll be gallavanting amongst DC’s cherry blossoms, which are most certainly not green. I’ll wear a green necklace though. The Dream: In the spirit of St. Patrick, I’ll be perfectly honest. I did not have a master plan. I knewJunior Mints were the candy of choice. I had a Junior Mints t-shirt in Junior High, as some readers will recall, that I thought was the most important clothing item I owned. I loved that shirt, as well as Junior Mints. In terms of wine, it proved to be a tricky choice. I did not want to go for light and fruity since those flavors would not work with chocolate mint. It needed to be rich. Fortunately, Malbec Madness was happening at the liquor store. Since Malbec Madness is a play on March Madness…it fit perfectly. Plus, I chose carefully. Layer Cake is described as rich with hints of tabacco. It looked like a wine in which I could immerse myself. Don't you want to take a swim? When I opened that bottle of wine, I immediately smelt it. The chocolate flavors engulfed me and I felt myself falling in love. I brought it over to Sam, but he did not seem that intrigued. I kept smelling it for awhile, looking forward to tasting this truly layered wine. I did not smell tabacco though, that was a bunch of lies (St. Patrick would not be pleased). As I poured myself a glass, I realized something upsetting. Who will play second (Irish) fiddle? I had to drink this wine, a meal unto itself, with a cheap theater candy. Already, this was not going to work. I ate a Junior Mint, which I will not make up fancy prose for. It’s a Junior Mint. Then I took a sip of wine and my mouth screamed in dismay. 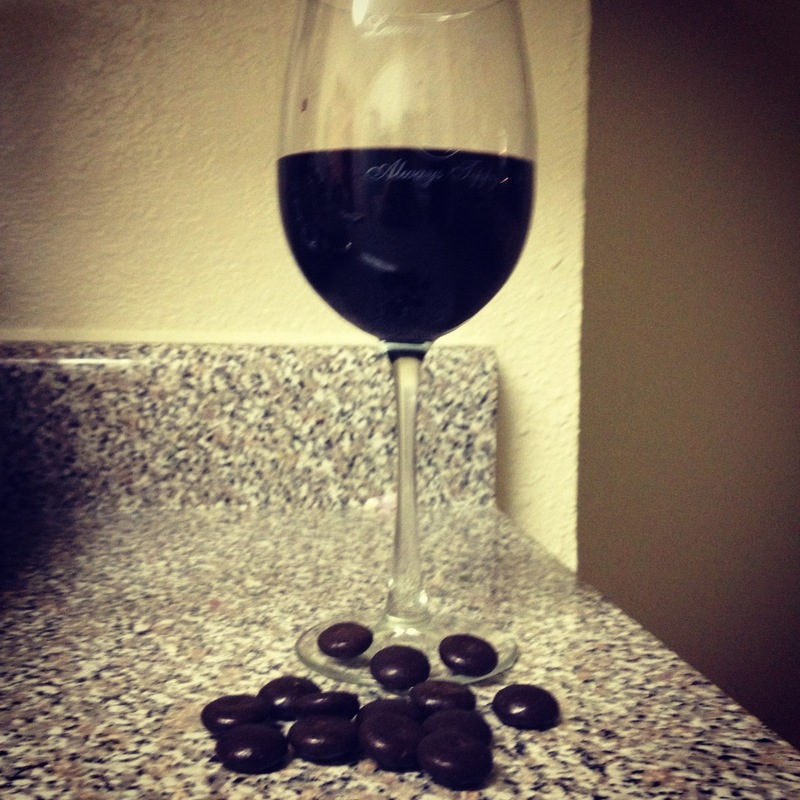 How could I distract from this round wine, with subtle chocolate flavors and richness that scoffed at a simple J Mint? Though the taste of cheap mint quickly washed out of my mouth, I spent the rest of the evening drinking wine. 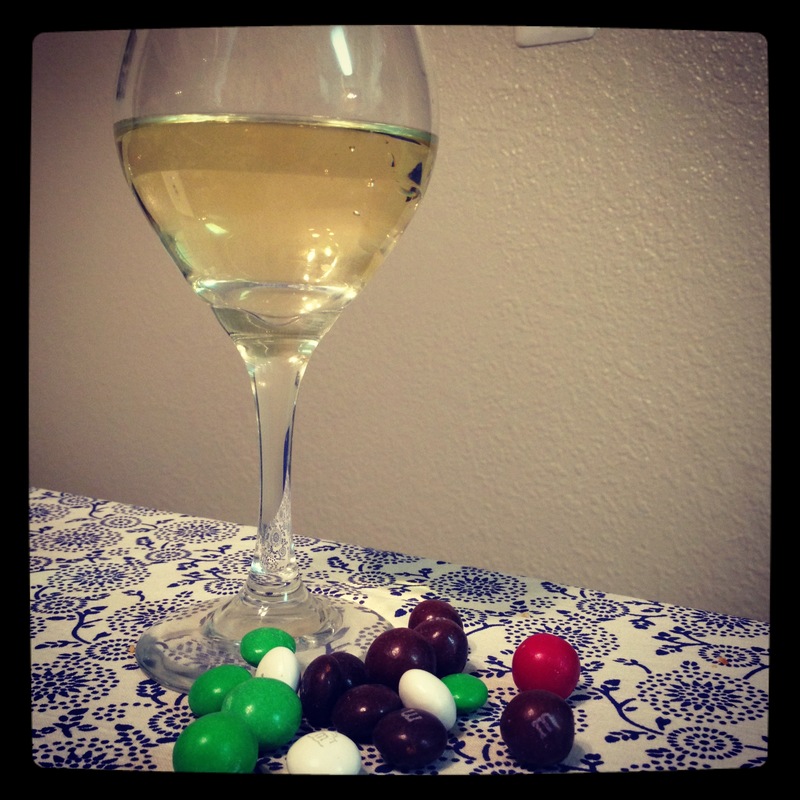 Here is the ultimate question then: can mint be paired with wine? I want to keep exploring this. 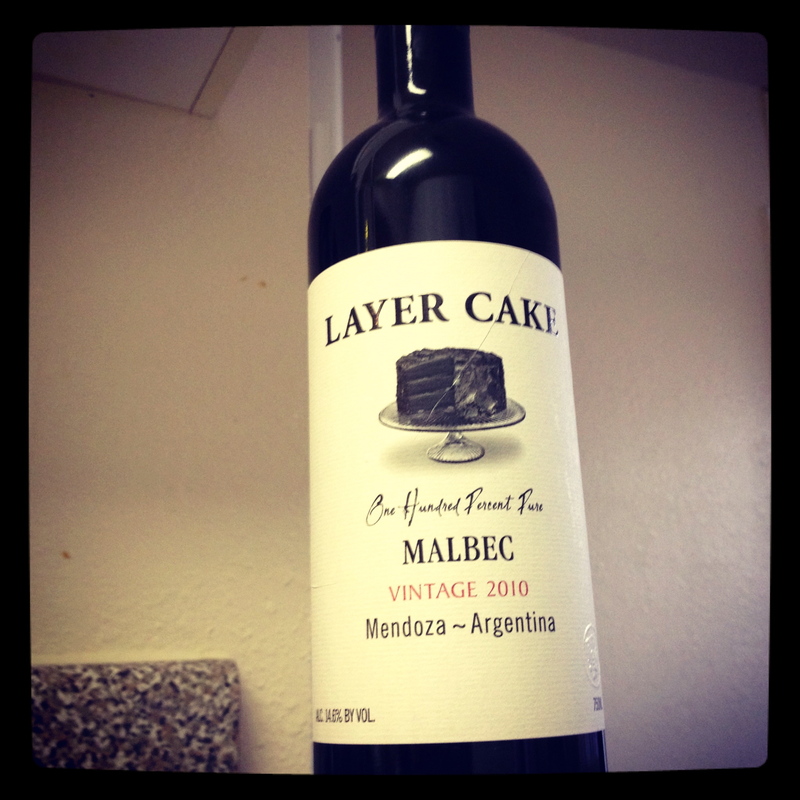 I don’t think a rich wine like Layer Cake, which I recommend, especially to those who love Cupcake, works with mint. Could I be more daring and try a white? Would that hold a surprise? Either way, drink up friends and enjoy your St. Pats. And buy some Layer Cake–St. Patrick would be proud. Posted in Malbec and tagged Cupcake, Green, Junior Mint, Layer Cake, Malbec, Mint, St. Patrick, Wine. Bookmark the permalink. I’m sitting right now in my sweltering apartment. With the strange spring weather alongside my 475 degree oven, it’s a little too hot to handle. Last summer it was also hot. Too hot, actually. Though I hate to be cold, I abhor being too hot. I feel puffy, sticky, and my fingers grow strangely rotund. Make-up melts off my face as I apply it. Clothing just feels wrong. Before last summer, I did not take to white wine. But with the high heat, it was all I wanted alongside dinner. 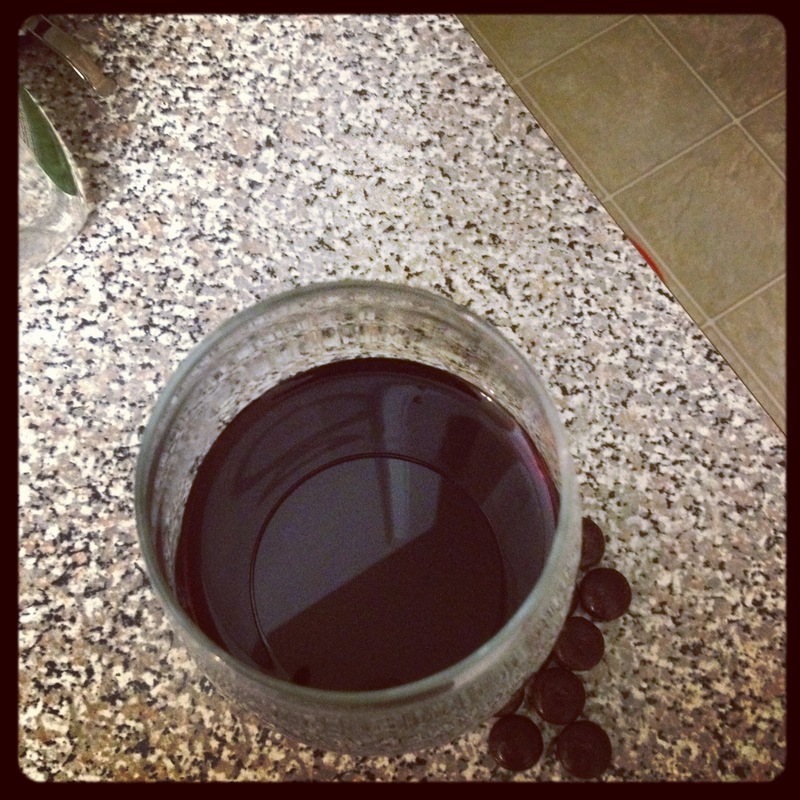 The wine grew hot pretty fast and the glass perspired, but those few first sections were all I needed. Speaking of melting (as in, melts in your mouth, not in your hand), it is time to unwrap an American classic: the M&M. I also wanted to keep things relatively cheap, by buying budget wine and candy. Initially, I wanted to do something crazy like buy Arbor Mist and the 99 cent bag of jelly beans. But this blog is supposed to bring joy, not unending stomach aches. And we’re not in college any more, so there is no excuse for that type of behavior. So, stop the world and melt with me (buddum cha!). I have a lot of complicated feelings about sentient candy people. I knew Rieslings were sweet, but I did not know the exact nature of their sweetness. But yellow tail is a fairly good budget wine, a step above Barefoot but not quite as good as Cupcake. I’m sure if my dad reads this, he’ll say: wait, YOU DRANK YELLOW TAIL? HAVE I TAUGHT YOU NOTHING! And I’d have to say yes. I love my dad, but when he talks about wine, I sort of start thinking about whatever I’m looking at. Like oh, look at this salt shaker. Way to do your thing salt shaker. But we’re off topic, probably because I’m overheated. I saw the coconut M&Ms at my work’s convenient store and immediately I started to plot pairing them. Coconut is tricky, because it can be understated or incredibly sweet. Yet if it was just the right amount of sweet, something beautiful would happen. I felt very confident about the pretzels, although it is sort of cheating. I mean, is a pretzel covered in chocolate really a candy? Since we were still in the M&M territory, I think I’m covered. But that got me thinking–do I have parameters in this blog? Should I have some? Dear readers, let me know. The wine isn’t that sweet. It is actually like eating a grape. I know how ridiculous this sounds, since this is wine we are talking about. But it felt like taking a bite of a green grape. Although it wasn’t tangy, just refreshing. The M&M pretzel took me for a spin. The salt plus the understated chocolate and candy coating truly took the Riesling to a different level. It enhanced it. Each one on their own would have been fine, but the flavors combined were complimentary. By complimentary, I mean a bite or sip of one led directly to a bite or sip of the other. The M&M coconut would benefit from something spicier, like a Malbec. The coconut inside the M&M tasted like chocolate coconut–it didn’t pop on its own. Which is all very well and good, but it was too thick to bring out the qualities of a Riesling. I plan to revisit the challenges coconut bring, but maybe by just making macaroons. So there we have it! Another long overdue post. I recently bought a Groupon for a bunch of wine I hope to pick up this weekend, so let’s have high hopes. In the mean time, perhaps I’ll prepare something to post on St. Patty’s Day. Maybe some Jr. Mints? What say ye? Also, I want to do a vegan post, but I need your help. Picking a vegan candy blind is a bit dangerous. And vegan wine…do we have thoughts, recommendations? Posted in Uncategorized and tagged Candy, chocolate, coconut, M&M, pretzel, Riesling, Wine, Yellow Tail. Bookmark the permalink.